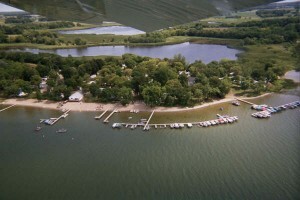 Eden Acres Resorts are family owned resorts nestled on the east side and west side of Lake Mary in Alexandria, MN. We are located just five miles from town and two hours from the Twin Cities, close enough to home, but far enough to plan your family vacation, or quiet getaway. Eden Acres I offers six beautiful cabin rentals to choose from, and a spacious sandy beach area complete with a volleyball net and paddle boat. All of our cabin rentals are CLEAN and MODERN, plus each offers a full kitchen, living room, enclosed bedrooms (bedding included), and bathrooms with tubs and showers All have 2 bathrooms per cabin. NEW–WE HAVE A LAKE FRONT SITE RIGHT ON THE POINT AND TO SELL WITH BEAUTIFUL SUNSETS VIEWS. CALL PAT @ 320-266-5868!! If you’ve never been to the city of Alexandria, MN, you’ll be pleasantly surprised at everything this beautiful town has to offer. The Viking Plaza Mall and Broadway’s downtown shops offer great shopping, including antique stores, boutiques and specialty stores. Alexandria has numerous golf courses, restaurants, local theatres, bowling, movies and a great local museum, you’ll never find yourself with nothing to do. Tennis, bowling, go carts, driving ranges, miniature golf, and NASCAR racing, are just a few of the many activities Alexandria, MN has to offer. Located on the East side of Lake Mary, Eden Acres I Resort. Located on the West side of Lake Mary, Eden Acres II Resort. Alexandria has a lot to offer! Check out these links to find fun activities and events for your family. Lake Mary is one of the larger lakes in the area (5 miles by 1.5 miles) and offers some of the finest fishing in MN. See fun resort photos and more.